Two down, eight to go. The second race of the Chase is behind us and while the championship picture isn't fully developed, we did get answers to our 5 Questions Before: Loudon and Kentucky. Brad Keselowski finished sixth, three spots behind Jimmie Johnson. Not Keselowski's best finish at the Miracle Mile, but not his worst. He lost the Chase lead to Johnson, but only by by a single point. Not an insurmountable lead by any means, but just like Hendrick cars run best in clean air, give Five-Time the points lead and it's like four-time champ Jeff Gordon said Sunday, "We have seen others make a run at them (the 48 team), but when they are in this kind of zone, they have not been beat. You know, I think what the 11 did was pretty big today, but he's going to have to do that for eight more weeks." Jeff Gordon finished third, but because no one ahead of him in points had a problem, he only gained two points on the Chase leader. "It's still going to take a miracle for us to win the championship." Gordon said. "I mean, you've got guys like Jimmie, Keselowski and Hamlin; I mean, these are guys that have been strong all year. You know, Jimmie's won five championships. These guys are not going to make huge mistakes. But we have to go and race every race." The closest a non-Chase contender got to victory lane was eighth place. 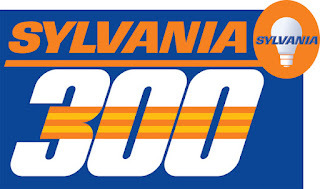 Joey Logano, Brian Vickers and Ryan Newman finished 8th through 10th. Kyle Busch led 48 laps, but engine problems kept him from claiming the win. Austin Dillon won the inaugural Kentucky 300. While the series visited Kentucky Speedway at the end of June alongside the Sprint Cup event, this weekend was the series first fall visit to the track, which gave the rookie a chance to sweep. Dillon did so in dominating fashion. Racing in the Camping World Truck Series did, in fact, get more intense. Although no one could catch James Buescher at the end, the rest of the race held the same nail-biting, screaming-at-the-TV intensity that the other races have held and then some. If you think Cup racing has gotten too tame and you're not already watching the Trucks, then what are you waiting for? And like cautions breed cautions, questions breed questions. Here are my 5 Questions After Loudon and Kentucky. Can anyone catch Jimmie Johnson? With the No. 48 team atop the points and seemingly with that golden horseshoe firmly in hand, can any of the other players knock the king off his hill? Can Keselowski or Hamlin keep the pressure on and force a mistake? Time will tell. What happened to the Fords? Sunday at New Hampshire the highest-finishing Ford was Matt Kenseth in 14th. In Chicago, Greg Biffle was 13th. Richmond? Kenseth in fifth. Atlanta? Kenseth in 9th. Bristol? Marcos Ambrose in fifth. Not since Michigan has a Ford visited victory lane. What's going on there? Will all the talk about Darian Grubb's success in the Chase light a fire under Smoke? Sure, with the win at Loudon, crew chief Grubb scored his sixth win in twelve Chase races, but how many of those first five would have have won had Tony Stewart not been behind the wheel? The final race of the 2011 season, it wasn't Grubb who passed 114 cars on the track...it was Stewart. Will the credit being given to Grubb motivate Stewart to remind fans he earned his first two championships with a different team and a different crew chief? Can Elliott Sadler capitalize on his points lead and keep Ricky Stenhouse Jr. from repeating as champion? Watching the Nationwide series points race this season's been a lot like watching a tennis match. Will that continue or can Austin Dillon come from behind and take it away from both of them? Can Ty Dillon hold off the hard-charging James Buescher? Or will Timothy Peters rebound from a rough couple of weeks and put the youngsters in their places? With only six races left in the season, there's one thing for sure. It's going to be exciting!